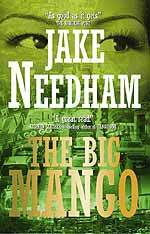 The author, Jake Needham is described on the fly-leaf as an American screen writer who is married to a Thai born concert pianist and has two sons and lives in San Francisco and Bangkok, however these days I believe his preferred domicile is in his own Big Mango, (AKA Bangkok). In his previous incarnation, Jake Needham describes himself as being born on a ranch in Texas longer ago than he now believes possible, and was a corporate lawyer in the United States specializing in international mergers and acquisitions until he finally grew up and became a writer. The book is set in the mid ‘90’s, and is a thriller. 400 million dollars has gone missing and more than one party would like to know how, where and who. In true thriller fashion, Needham keeps the pace up and the twists and turns are such that the reader has to be on the ball to keep up. International intrigue involving the DEA, CIA and other agencies with acronyms you have not met before will keep you enthralled. It certainly kept me on the edge of my seat. The RRP of B. 425 buys the book and gives the answer! After the release of their groundbreaking debut album simply titled “Crosby, Stills, & Nash’’ in 1969, a successful appearance at Woodstock followed, which was the band’s only second performance in public. Quite frightening as it was at the peak of the festival, so they performed in front of over 500, 000 people for which they added for the first time their great friend Neil Young (David Crosby’s very words from the stage). 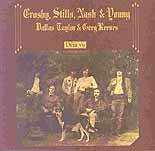 Less than a year later, with Neil Young firmly ensconced in the ranks, they recorded ‘D้jเ Vu’. When it was originally released it came in a lovely textured brown sleeve with golden inscriptions, and a black and white picture of the Band pasted on the cover. This made it look like a poster from an old wild west saloon, pure class and original, like the rest of this album. So this was the first time Dave Crosby - ex The Byrds, Stephen Stills - ex Buffalo Springfield, Graham Nash - ex The Hollies, and Neil Young - ex Buffalo Springfield had recorded as a band (heralded as the first American super group, whereas in fact Graham Nash was English, and Neil Young Canadian) with the addition of Dallas Taylor on Drums, and Greg Reeves on Bass. The album ‘Deja Vu’ was #1 in America on pre-sales alone, such was the expectations of their second album. It soon became #1 worldwide as the boys did not fail to deliver the expected goods. Throughout the album the harmonies are picture perfect, the guitar work exceptional, and the songwriting of the highest standard. The sound of the songs brings music screaming and shouting out of the hippie days of the sixties into the more realistic days of the early seventies, keeping the poppy feel of the sixties as it adds a hard edged guitar sound more identified with the seventies. Saying that, the album is timeless. The album contains songs from each of the four artists that were to lay the template for the rest of their careers. Two songs from Stephen Stills, including opener ‘Carry On’, which shows all the facets of the collective musicians, beautiful harmonies, and spiraling guitars that bring the song to a dramatic climax after a beguiling vocal break in the middle section. ‘Carry On’ was often stretched out to over twenty minutes in the electric part of their live set. Stills later shows the other side of his songwriting ability with the mournful acoustic ballad ‘4+20’. Graham Nash follows ‘Carry On’ with the perfect pop tune devoted to the next generation, ‘Teach Your Children’. The long time friend Jerry Garcia from The Grateful Dead joins on steel guitar. As if there wasn’t enough talent on this recording already. Nash also contributes ‘Our House’, written about his time living with Joni Mitchell. This song must have lightened many relationships over the years. One listen would melt even the hardest heart. In contrast we are given the guitar/rock of Dave Crosby’s ‘Almost Cut My Hair’. 33 years later it is still the most requested song from Crosby, whether as a solo performer or as a collective with other members of these musicians. The lyrics were inspired after the tragic assassination of Robert Kennedy, and are typical of the time. Crosby also supplied the title track with its fascinating false beginning, heartfelt lyrics (specially for a man of only 25), amazing display of the bass guitar from Greg Reeves that was to inspire generations of American bass players, and yet another star guest appearance - John Sebastion (ex Lovin’ Spoonful) on Harmonica. John Sebastion was almost in the band himself after jamming with the others at Mama Cass’ house in their formative days. The final track on the album is the rocking ‘Everybody I Love You’, co-written by Stephen Stills and Neil Young. A fine way to bring the album to a fitting climax. It was obvious that there was far too much talent, not to mention too much ego, amongst these musicians for them to stay together as a band. But while they were, what glorious music they made. Only last year they were able to bury all their past hatchets and perform together again. According to reports none of the magic they had created way back then had been lost. Many people consider ‘Deja Vu’ to be one of rock music’s all time classics. Mott the Dog is not one to disagree.